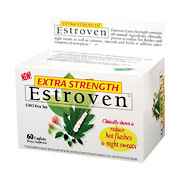 Estroven Extra Strength is for women who need strong relief but don't want to take prescription estrogen. The herbs, vitamins and minerals is Estroven Extra Strength work to help relieve many of the physical and psychological symptoms of menopause as well as support important areas of health that can be affected by the changes that occur during menopause. Take two (2) caplets once per day. Best taken near mealtime. Other Ingredients: microcrystalline cellulose, croscarmellose sodium, vegetable stearic acid, vegetable magnesium stearate, silica, cellulose, titanium dioxide, and sodium citrate. Susan W. "Have my life back"
For the past month I have been suffering with at least ten hot flashes a day and four or five each night. I saw Extra Strength Estroven in my Walmart store and decided to give it a try since it is purported to help with night sweats and hot flashes. I've been on it for two weeks, and last night was the first night in at least a month I could sleep through without being awakened by a hot flash, and today I didn't experience a hot flash all day. I can finally get my life back. Extra Strength Estroven is my salvation. It helps me eliminate afternoon fatigue. I have been taking Extra Strength Estroven for 3 months after deciding to stop taking prescription estrogen. I feel wonderful and alive again without the weight gain, bloating and worries that I had when on prescription Estrogen. I recommend Estroven to all my friends. THANK YOU ! THANK YOU! Lila "Thank God for Estroven"
Thank God for Estroven!! I have tried every over the counter product since coming off HRT two years ago. Finally I tried Extra Strength Estroven. It took about two weeks for the product to kick in but I am so satisfied with the results. I was having hot flashes six and seven times daily and waking up at night three or four times soaking wet with perspiration. The symptoms vary now but I don’t seem to have any during the day and so far I am sleeping at night without waking up. Thank you for a wonderful product. I will tell my friends about Estroven. And when I saw my doctor last week, I asked him if there was an alternative yet to HRTs and he said, “Only what you are taking. If it’s working, keep taking it…” Thank you again for your wonderful product. I have been using Extra Strength Estroven for a month now. I cannot begin to tell you what a godsend it has been for me. I was suffering from hot flashes all day long (at least every 25-30 minutes apart) and I could barely sleep at night due to the sweating which constantly woke me up. I noticed an improvement after about a week – the hot flashes reduced significantly as well as the night sweats. I actually have not had ANY hot flashes† in at least a week and I have been sleeping through the night – I don’t wake up all night long like before. This is one of the best products I have ever used. Imagine, a product that REALLY does what it claims to do. Thank you from the bottom of my heart for giving me my life back!!! 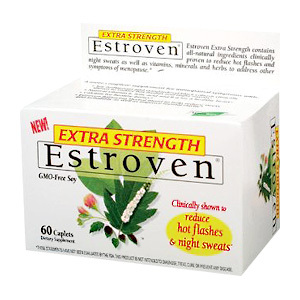 Does Estroven Extra Strength contain synthetic estrogen? No. The Extra Strength formula is an all-natural, drug-free, dietary supplement that helps reduce hot flashes, night sweats and other menopausal symptoms with a combination of herbs, vitamins, and minerals including naturally occurring plant compounds. Why do you suggest I take Estroven Extra Strength near a mealtime? We recommend taking all supplements with food to help avoid the minor stomach upset that may occur when taking any supplement on an empty stomach. It may be best to take the caplets with your morning meal as the Extra Strength formula contains natural ingredients that provide you with energy you need throughout the day. Additionally, some nutrients such as vitamin E and the B vitamins are better absorbed with food. When taken as suggested, some women may notice benefits in 7-10 days but it is important to remember that Estroven Extra Strength is a natural supplement and it may take a few weeks to work in harmony with your body. Most ongoing benefits are realized within 30-60 days of continuous daily use. Can I take Estroven Extra Strength in addition to other supplements I am taking? You may take Estroven Extra Strength with other supplements including multi-vitamins, calcium and herbs. As with any nutritional supplement, it is important to consult your physician before taking Estroven Extra Strength. Your physician should be aware of all supplements you are taking. There are no known side effects or risks associated with the recommended dosage of the ingredients in Estroven Extra Strength when taken by healthy individuals. Your medical history plays an important role in the effect supplements will have on your body and your physician is the most qualified person to help you make informed decisions about your health. Do not take if you are pregnant or lactating. Keep out of reach of children. Estroven Extra Strength is shipped in a discrete, unmarked package. Orders are processed immediately and usually take about 3 to 5 working days to be received. We do ask that you try it for 2 to 3 weeks to feel the full effects. Any information received is used only for order processing and shipping purposes. Your information, such as e-mail address, will never be disclosed to a third party.